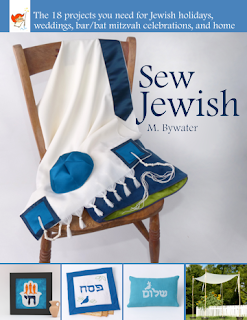 I always love looking at new sewing and quilting books. When Maria reached out to me about her book I wondered how helpful it would be for me. I'm not Jewish and only have one person in my life who is Jewish. I quickly realized though this book has projects than anyone could or would make. There are 18 projects in the book as well as background information about the teachings and history of each project. I love combining my passion of sewing with my passion of learning about other's traditions. So let's get sewing! Let's start with a little background information on Maria, the author. Maria Bywater converted to Judaism in a modern Orthodox community in Washington, D.C. She is the designer behind the leading national wedding chuppah rental company, Huppahs.com. Maria has lived in Tunisia, Kuwait, Libya, and England, and now lives in New York’s Mid-Hudson Valley with her two daughters amid a large extended family. Maria is a very sweet woman. I've enjoyed chatting with her on Twitter. I quickly realized that while I'll probably not have many opportunities to make the exact projects in the book there is more than enough information in the book to make it worth your money. It has a great section in the back of techniques. It covers fabric basics, transferring patterns, machine and hand embroidery, as well as machine and hand stitching. Many of the projects can quickly and easily be adapted to many other applications. The Challah cover is the perfect example of this. You don't have to use her applique designs you can use your own. If you don't have a bread cloth you need to make one!! So what are the projects you get patterns for? 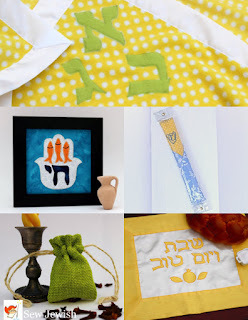 The challah cover I mentioned above as well as Hanukkah Dreidel Game Kits, Purim Mishloach Manot Boxes, Passover Matzah Cover, Hand Washing Towel, Havdalah Spice Pouch, Wedding Huppah, Bridal Veil, Kippah / Yarmulke, Tallit, Tallit Bag, Tefillin Bag, Mezuzah Scroll Case, Tzedakah Jar Wrap, Mizrach, Hamsa, Shalom Pillow, and Aleph-Bet Cuddle Blanket. I really enjoyed this book. If I didn't I wouldn't be reviewing it here. I encourage all of you to check out Maria's blog. If you would like to purchase the book in paperback you can from Amazon and Etsy. You can also get a downloaded version of the book on Etsy.